This is topic French 9,5 group projections in forum 9.5mm Forum at 8mm Forum. Tomorrow, the new monthly projections (in 9,5, of course) restart with "Sans famille" (1934). It will start at 2.30 pm at "La salle de spectacle des Abondances" 47-49 rue saint-Denis (Boulogne/Paris) metro : Boulogne Pont de saint-Cloud (line 10). The film "La merveilleuse journée" will be projected on 13 th May at 2.30 pm at La salle de spectacle des Abondances 47-49 rue saint-Denis at Boulogne (very close to Paris, the Parigian metro goes to Boulogne. Usually amateur films (in 9,5 of course) are projected before the film. Exceptionnaly, the first part of the monthly projection (the last of the season, the next one will be on 21st October) will be a tribute to Shirley Temple instead of amateur films. Two shorts will be projected : Shirley Temple chercheuse d'or and Shirley Temple moucharde (What To Do ?) The main film is a French one Cendrillon de Paris (1930). It one of the few places where you still can attend a real projection. The new season of the French club's projections will start tomorrow (two days after the British Annual Get-Together). Isn't that nice ? The main film will be "Les croix de bois" and there will also be a tribute to Charlie Chaplin. Only a few days to wait for the next meeting. That will happen on Tuesday 20 th January at, as usual, la salle de spectacle des abondances (47-49 rue Saint-Denis at Boulogne which is reachable with the metro, station Boulogne-Pont de St Cloud). The projection starts (theorically, we're Latins :-) at 2:30 pm. 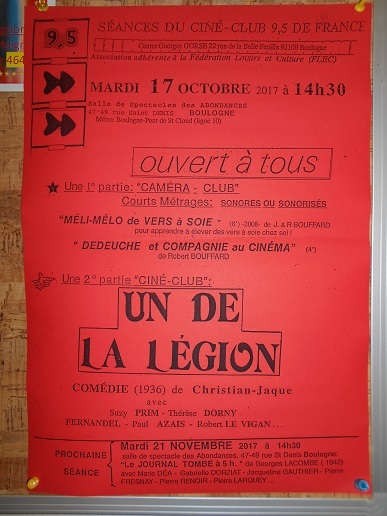 The feature, La veuve et l'innocent (a French film dated 1948)will be preceeded by an amateur film La France miniature (2008). If you miss this, the next projection will be on 17th February and the 1937 feature will be Partir ou mourir (The Edge Of The World). On Tuesday 17th February, the 1937 film "Partir ou mourir" ("The Edge Of The Wold") will be projected. This feature will be preceeded by an amateur film "L'escargot express II" (10 minutes). As usual, the meeting is at 2:30 pm. Tomorrow, two films will be projected. First, an amateur film from René Dupin : Voyage en Israël (Travel In Israël), a film shooted last year with a duration of 39 minutes. Then a 1932 film, Les seigneurs de la jungle (Bring'Em Back Alive). I finally found how to post pictures on the forum ! No less than three camera films for the first part : "Paris nostalgie", "Lyon et la rose and Noisette", "Indienne et les autres...". The second part is the feathure "Les femmes s'en balancent" with Eddie Constantine. King Kong will be projected on the 17th November. Two amateur films will be screened before the main film : "Edith Piaf" and "Histoire sans fin". I remind that these projections are held in Paris (in Boulogne to be precise, metro Boulogne-Pont de St Cloud) at 2:30 pm (it usually starts a little bit later that announced). Eiki xenon 9.5mm? Very impressive! Not only an Eiki xenon 9.5 - but a Slot load. Never seen a 9.5 Slotload before. Very nice. Due to the situation in Paris, the projection may have to be cancelled. 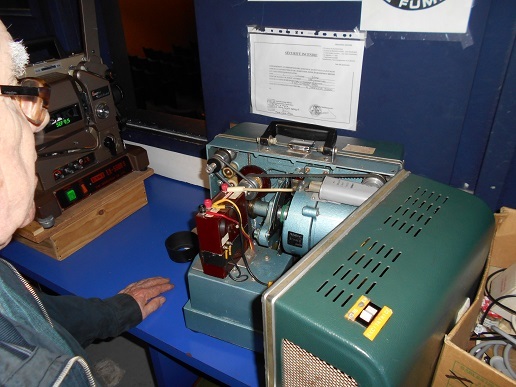 This will be known only on Monday morning as the responsible of the projection room has to be contacted. Nobody knows at this moment how things will evolve in Paris in the following days. The club decided not to cancell the November projection. There has been also a projection in December (that I forgot to remind here) and there will be one tomorrow. If you're Lucky to be in paris, you will able to see : "La merveilleuse journée". 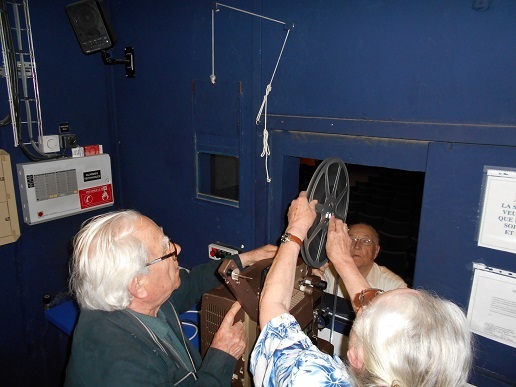 Next Tuesday, two amateur films will be projected before the main film "Rouletabille aviateur". 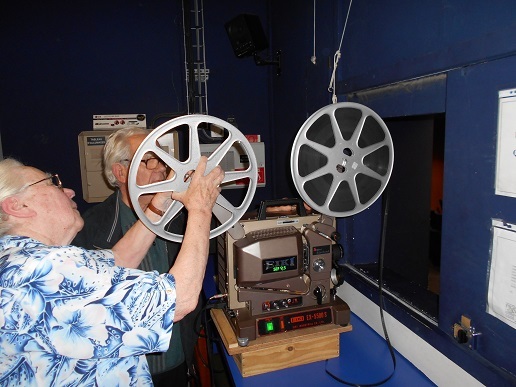 For the Lucky ones who will be able to attend the next projection (on Tuesday, the 15th March), there will be two amateur films (14 minutes and 7 minutes), then "Ademai au Moyen Age". Next Tuesday : Jacques et Jacotte", a 1936 French film. Before that an amateur film and a Buster Keaton short (for his death's 50 th anniversary). Last projection of the season on Tuesday, the 24th May. Two amateur films for the first part and then Shirley Temple aime les chiens (Pardon My Pups) and Panorama musical (a 1945 film, the title says all : it's a documentary about the story of music). There will be no projection until the 18th October because of the Holiday season. Next Tuesday : "La Chevauchée des Hors la Loi" (Land Of The Lawless). Mon oncle et mon curé will be projected next Tuesday. 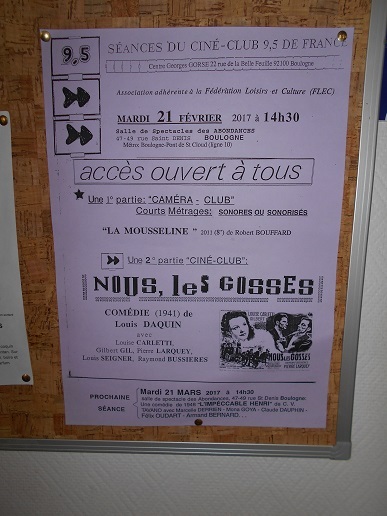 On the 21st February, there will be first a short made by an amateur in 2011 and tittled "La mousseline" and then "Nous les gosses", a 1941 French film. Near the projector there is a tape recorder? It needs for an audio accompaniment, when the movie is mute? On the 21 st March : the main film will be L'impeccable Henri and there will be two amateur films : La Clara fuente and La sonate du pendu (The Hanged's Sonate). The Buckingham that will be used. The three pulleys are visible on the picture. I don't know how rare it is but I had never seen that before. The blades of the shutter are impressively larger than on the other Eiki machines I saw so far. 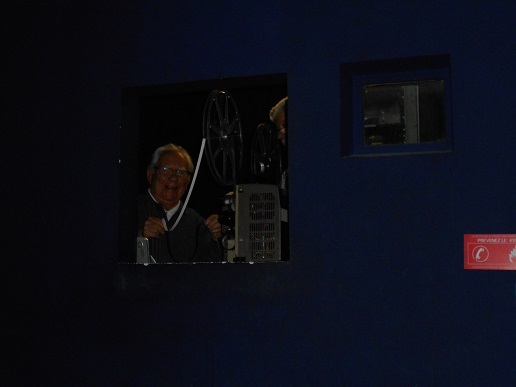 Monsieur Huard, the projectionnist (he's a real one, that was his job), has a look to check everything. 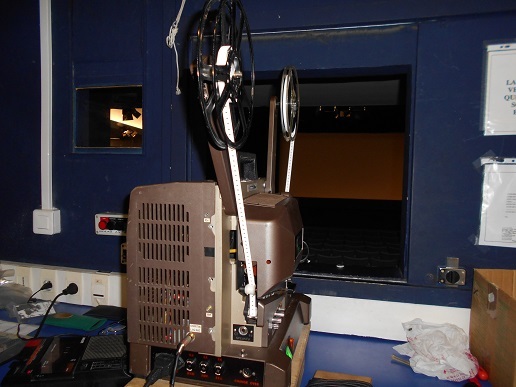 The projector beside is the one used for the 11 th April projection. Both machines are xenon ones. 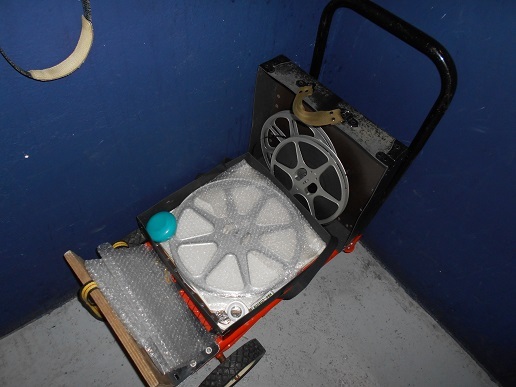 There is a third 9.5 projector (not an Eiki) in the magic cupboard (but more than probably not a xenon). Sadly the May projection will be the last of the season. The Summer break will last until October. The film that will be projected next month (on the 16th May) will be La guerre des valses with some famous actors like Arletty. As always, there is a 4 pages programme. As annouced in the programm, the season restarted last Tuesday. The poster, that comes, as each time, in addition to the programm. 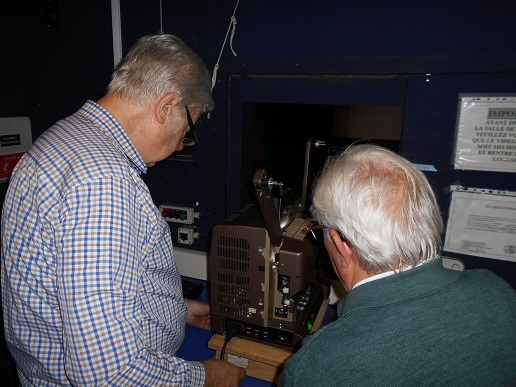 The club's projector ready for another season after its Summer Holiday. (on the picture) processed himself to test his home made 9.5 process tank. It has to be tested more but the results are very promising and with a trial and error method, Monsieur Dupin is confident to be able to get a perfect result. These tests are made in addition to the tests that are made by the professionnal Spanish lab. I aked the question about the legal question. It seems that what is forbidden in France is to process black and white films for professionals but not for amateur (it's a question of quantity...). If you're in Paris tomorrow (Tuesday), don't forget the monthly projection The feature that will be screened is "Accusée, levez-vous". Tomorrow, Graine au vent will be the feature showed. Sadly, the May projection has been cancelled due to the trains strike in France. Next projections will happen in Limoges during the International 9.5 festival and the season in Paris will restart in October afetr the yearly Summer break. 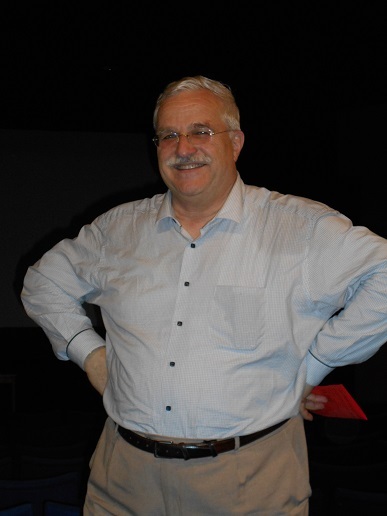 For the first projection of this new season, after a amateur film ("Briare, le canal", "Mission à Tanger" will be screened. As usual, it will start around 2:30pm.